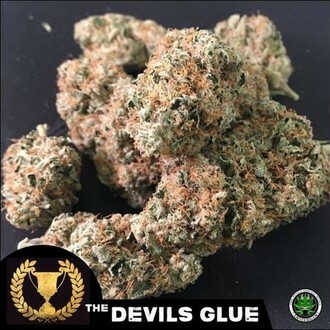 Devil’s Harvest Seeds proudly presents the Amsterdam High Times Cannabis Cup-winner Devil’s Glue. The hellish combo of two of the most-recognised cannabis genetics makes for some extraordinarily good weed: super-resinous, with high THC content and a good balance between indica and sativa. The breeders at Devil's Harvest Seeds weren't fooling around when they created Devil’s Glue. No less than the genetics of the renowned Gorilla Glue #4 and the prize-winning OG Reek’n made their way into this feminized hybrid champion. Like a bat out of hell, Devil's Glue quickly proved her merit by scooping up the 1st place extract award at the 2017 HTCC Amsterdam. Devil’s Glue is a first-rate hybrid that stands out in many ways. She has just the right balance between indica (60%) and sativa (40%). The plant reaches a medium structure if you grow her indoors in a typical setting. Outdoors under plenty of sun, she may well reach up to 2 metres. But no matter where you grow her, this girl is very low-maintenance; so easy, in fact, that even inexperienced growers can look forward to exciting results. She also adapts well to techniques like SOG and ScrOG, allowing more experienced growers to really max out their yields. Her flowering time is quite reasonable since she matures her fat buds in a short 60 days. Get ready to harvest 300–500g/m² of compact and incredibly sticky buds indoors in good conditions. Grow her outdoors, and you may well get up to 1000g/plant. Given her superior genetics, it isn’t surprising that Devil’s Glue is quite potent. Scoring with up to 26% THC in her smoke, this variety makes for an awesomely intense and fast-hitting high. Although she contains very low levels of CBD, She is well-suited for relieving sleeping troubles, stress, and worry. Her effect is nicely balanced in that it is super relaxing, but also puts you in a great mood. Her aroma is surprisingly complex. She blends earthy notes with subtle tones of lemon and diesel for an awesomely aromatic and mouth-watering smoke.